Launched in 1856 as a proud product of the Buffalo, New York shipbuilding industry, the New York was a wooden steamer. 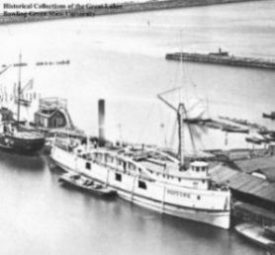 She saw just over two decades of active and faithful service on the Great Lakes before she was sadly lost to a storm and heavy seas in October of 1876. She now rests close to the wreck of the Checotah in 117 feet of water. She is a sight to explore with her partially intact hull, debris field, and part of her unique “hogging arch” still intact and visible. What’s more, her oscillating steam engines are a rare sight, fully exposed to view and of particular interest to maritime specialists and sport divers. With her depth, she is a great wreck for intermediate to advanced recreational and “tec-rec” divers to fully explore. We visit the wreck of the New York from Port Sanilac.